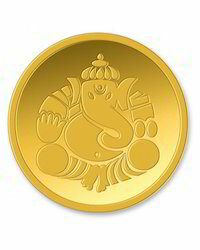 Lord Ganesh Gold coins can be made in 22 kt & 24 kt. Export quality finishing of the coins are best for export, Diwali gifts & other promotional giftings. We offer 10gm Yellow Gold Precious Biscuit. This Goddess symbolizes the woman power which is capable of ridding the humanity of the evil. The nine-day festival of this Goddess is celebrated with great gusto throughout India. - Available from 1 gram coins upto 1 Kg biscuits. A range of gold coins start from 1gm, 5gm, 10gm, 50gm, 100gm up till 1 Kg can be bought from us at the least competitive rates in market. We give you 100% Certified and approved gold coins with 995 mark and 24K. The value of the gold is retained wherever you go with the current prices. Providing you the best range of gold coin with effective & timely delivery. Om Shilpi Jewels & Gems Pvt. Ltd.